He is about 40 years old. Day and night he chisels away at pieces of wood with his tools. 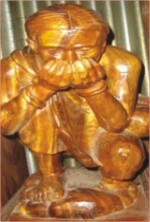 This lonely sculptor from Sirajganj is Naresh Sutradhor. 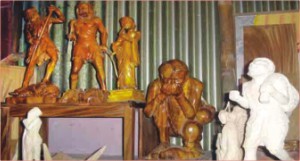 Naresh makes his living building sculptures and idols- gods and goddesses carved into wood. His handiwork, however has been praised not only well outside of his locale of Sirajganj, but have received praise well beyond his country. His creations have been sold and appreciated, among other places, in Germany, Russia, Canada, Italy, the United States, Japan and India. In spite of this, Naresh is struggling. His talents aren't readily converting to cash, and his job is taking a toll on his life. He doesn't have the means to work to the capacity that he would like to. He dreams of holding a big exhibition some day- but he is unable to get the financial support to realize that dream. Naresh comes from a family artisans. His father, the late Kalipada Sutradhor made a living making boats. It is not surprising that Naresh would learn the intricacies of woodwork from a very early age. His mother Shabetribala Sutradhor, a housewife, painted those boats with homemade paint made of liquid rice-paste. His own decision to enter the woodwork trade almost came automatically- he started chiseling away on wood sculptures as though any other profession was inconceivable. He has no thoughts on whether he regrets his chosen vocation. In spite of the hardships, this is simply what he was born into. Naresh Shutradhor is currently living at Kalibari Ghospara with his wife Kalpana Rani, 35. Together they have a couple of children, a boy and a girl. His family's days are passed in financial hardship, which has not in any way been alleviated by government assistance or any donor agency. 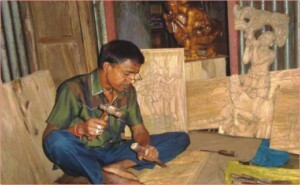 Naresh gathers his raw material- wood- from local markets and then carves designs onto them or sculpts them into the forms of idols. He claims these products are then marketed both locally and internationally, though, one would infer from his financial condition that revenues don't quite reach him. Where do the profits go? Naresh seems stuck in a trap that was not of his own choosing. It is very difficult for him to keep producing due to his own financial condition. He has also expressed a desire to set up a small museum of his crafts in Sirajganj.